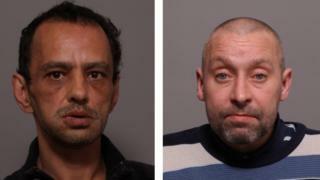 Two men have been jailed for the manslaughter of a man found dead with a head injury following an assault. Christopher Crane was jailed for 13 years with an additional four on licence, while Christopher Pendery was sentenced to 10 years. Carl Pask, 47, was found dead in his flat, in Kimberley Road, Evington, Leicester, in March 2016 after his family reported him missing. They were sentenced at Leicester Crown Court earlier. Crane, 46, of Queen Street, Shepshed, and Pendery, 39, of Woodland Drive, Braunstone, were convicted of the manslaughter of Mr Pask after a trial in November. In a statement released after the pair were jailed, Mr Pask's wife Carole said it had been a "difficult and emotional two years" but that "justice had been served". "I would like to say how proud I am of our daughters who have been incredibly strong through such difficult times," she added. "Although Carl was a troubled man he was a kind, caring and loving husband and father to our two daughters. He was extremely hard working and devoted to his family."